Tips and Tricks : Toddlers have their spill-proof cups and now so do moms! With these cups, even big “kids” have no more excuses for making a mess! To make it easier for a baby to transition from drinking from a bottle to drinking from a glass, there's a range of spill-proof cups, also called sippy cups, by our English-speaking colleagues. These allow the child to have the sensation of drinking from a real glass while minimizing the risk of messes at home or out and about. But we all know a few adults who could use one of these cups, especially when they are enjoying a nice glass of wine. What a tragedy when they spill their cup of Merlot on a new tablecloth or when wine from an excellent vintage is wasted due to a bit of clumsiness! This waste is now a thing of the past. Baby has his spill-proof cup and now so does mom! The double-walled tumbler is designed specifically for wine lovers who do not want to lose a single drop of their drink, no matter where they are: at home, camping, at the cottage... adventure! The cup's double wall provides perfect insulation and keeps drinks cold. It can even be used for hot drinks! Multipurpose accessories, we like those! Its lid is used in the same fashion as a child's cup and since the glass is robust, it is not likely to burst into a thousand pieces as is often the case with regular wine glasses. So, pour yourself a big glass of red, white or rosé and sip your favorite drink without worrying about making a mess. Get the 2 cup set on Amazon for the price of $29.72. Do you know what else is great about this cup? It can also be used by people who's hands shake a lot, for various reasons, mostly health-related ones. In fact, one customer explained that she purchased this cup for her husband who has Parkinson's disease and who has a tendency to frequently spill drinks or break glasses. More of a beer drinker? Although this double walled cup can be used for all your favorite drinks, its shape obviously looks like a wine glass, so, beer fans will likely prefer this model that looks just like a beer glass! The cup can be lugged around everywhere and it's made of plastic stronger than glass. Practical for sitting by the pool during the summer, while taking a break during a golf tournament or simply sitting in the basement watching the hockey game and tensions start rising! It sells on Amazon for $14.93.$. Have a corkscrew with you wherever you go! This must have happened to you at least once or twice: stuck with a bottle of wine... and no corkscrew at your disposal. Or visiting someone who has recently moved into a new house and who, oh great tragedy, cannot find their precious corkscrew. 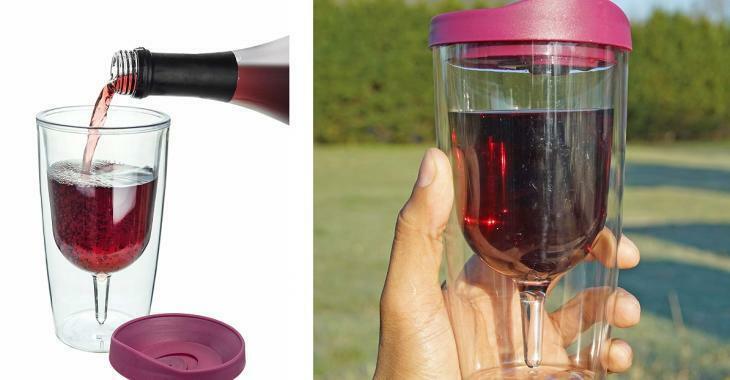 Kill two birds with one stone using this cup with built-in corkscrew! Similar to the models we've already shown you, this cup is equipped with its very own easy to detach corkscrew. This one can be yours for just $16.49 on Amazon. With all these different cup models, messes are now a thing of the past! *This article contains partner links.